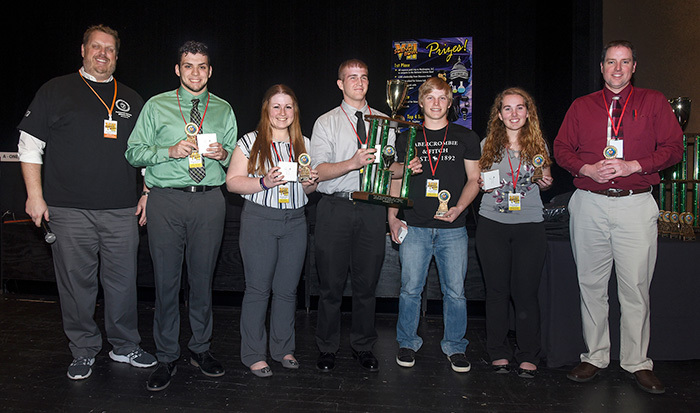 For the third straight year, it was Wheelersburg High School who claimed the title of Champion of the South Central Ohio Regional Science Bowl presented by the U.S. Department of Energy on Friday, March 15, at Shawnee State University in Portsmouth, Ohio. Wheelersburg Team 1 proudly displays the regional championship banner just moments after claiming the school’s third consecutive title at the U.S. Department of Energy’s South Central Ohio Regional Science Bowl. Pictured, from left, are Fluor-BWXT Communications Director Jack Williams, coach Paul Boll, Aaron Bundy, Austin Meyers, Rohit Kataria, Meena Kirkendall, Quin Whitley and Greg Simonton, DOE Coordinator for the event. The Pirates sealed the championship with a 46-12 victory in the finals against Zane Trace High School, which also had a very memorable day by having both of its teams advance to the semi-finals with identical 6-0 records. Zane Trace Team 1 defeated Team 2 by score of 16-8 in the semi-finals to earn the spot in the finals. 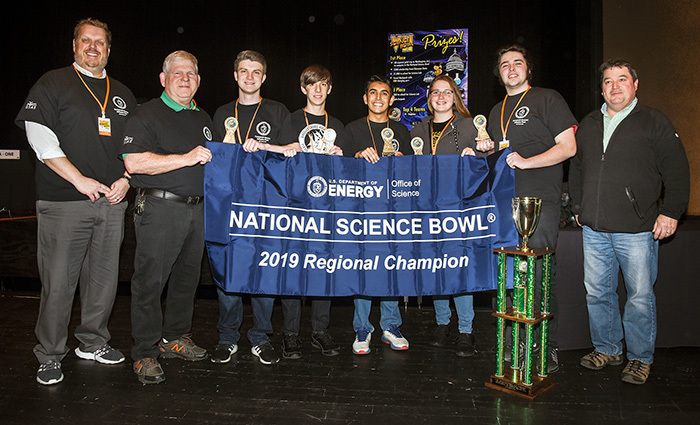 A total of thirty-two teams from 19 area high schools competed in the event with an all-expense paid trip – courtesy of DOE – to the National Science Bowl awaiting the champions. Congratulations to all the teams who placed and/or participated in the competition. Special thanks to all of the volunteers who make this event possible every year. Above, students from Zane Trace High School (Team 1) in Chillicothe claimed second place in the Science Bowl at Shawnee State University on March 15. Pictured, from left, are Jack Williams, Jaiden Rittinger, Dee Corcoran, Austin Carroll, Cougar Stauffer, Maylee Brower and coach John Scott IV.